Dr. Jenny C. Chang is the Director of Houston Methodist Cancer Center and Emily Herrmann Chair in Cancer Research in Houston, Texas. She obtained her medical degree at Cambridge University in England, and then completed fellowship training in medical oncology at the Royal Marsden Hospital/Institute for Cancer Research in the United Kingdom. She was also awarded a research doctorate from the University of London. Her recent work has focused on the intrinsic therapy resistance of cancer stem cells, which has led to several publications and international presentations. 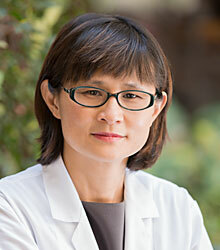 Dr. Chang’s clinical research aims to evaluate novel biologic agents in breast cancer patients. Dr. Chang has worked in the field of tumor-initiating cells for more than ten years. After her discovery that tumor-initiating cells are chemo-resistant, and that targeting the EGFR/HER2 pathway can decrease this subpopulation, Dr. Chang has played a key role in demonstrating some of the limitations and mechanisms of tumor-initiating cells (Creighton et al., 2009; Li et al., 2008). Her work is now focused on the mechanisms that regulate TICs, as well as initiating and planning clinical trials that target this critical tumor initiating subpopulation. She is also interested in characterizing the cross-talk between these different pathways that may lead to mechanisms of resistance, and has identified some of the chief regulatory pathways involved in TIC self-renewal. She is a world-renown clinical investigator, credited as one of the first to describe intrinsic chemo-resistance of tumor-initiating cells. Phase II Study of The Efficacy And Safety of Chloroquine (C) in CombinAtion With Taxane or Taxane-like (T) Chemo Agents in The Treatment of Patients With Advanced or Metastatic Breast Cancer Who Have Failed Anthracycline Chemo Base Therapy.